“Steadfast in affection or allegiance; loyal." There were a lot of ideas in Gov. Wolf’s budget address, including workforce development, career and technical education and quality education, which are areas of focus that our caucus agrees with and will work together with the governor to address. I believe these key ideas are important to all Pennsylvanians. As a member of the House Appropriations Committee, my colleagues and I will review the details of each initiative within each agency and ensure that the taxpayers’ money is being used appropriately during hearings over the next few weeks. To view my full remarks, click here. 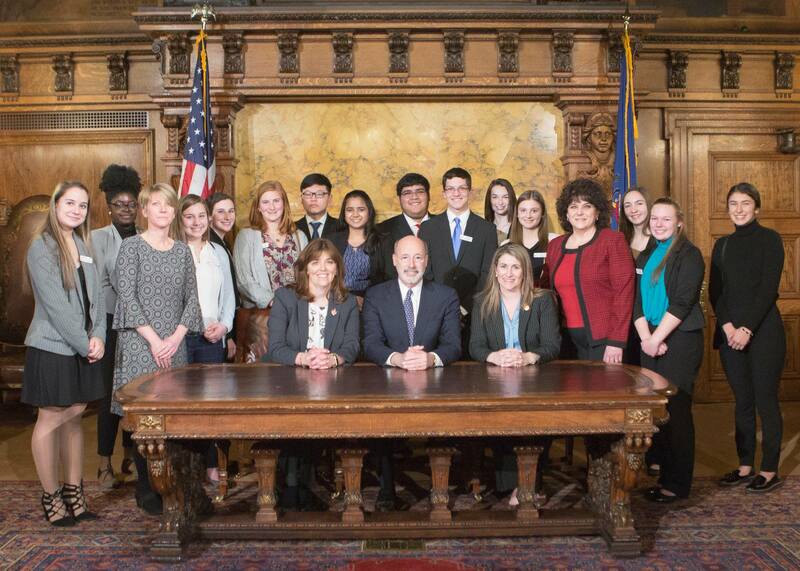 This week, I had the pleasure of introducing some local FBLA chapter members from Pleasant Valley and Stroudsburg High Schools on the House floor in recognition of National Future Business Leaders of America – Phi Beta Lambda Week, Feb. 3 – 9. FBLA programs are prevalent throughout many of our school districts in Pennsylvania and strive to develop students' business and leadership skills and encourage community involvement which will enhance their daily lives in the future. I want to especially thank the advisors, Denise Hopley of Pleasant Valley, and Jodie Haggerty and Kathy Sickler (2015-16 FBLA State Advisor of the Year), both of Stroudsburg, who freely dedicate their time to these students. I wish these students well and hope that their futures are full of success! 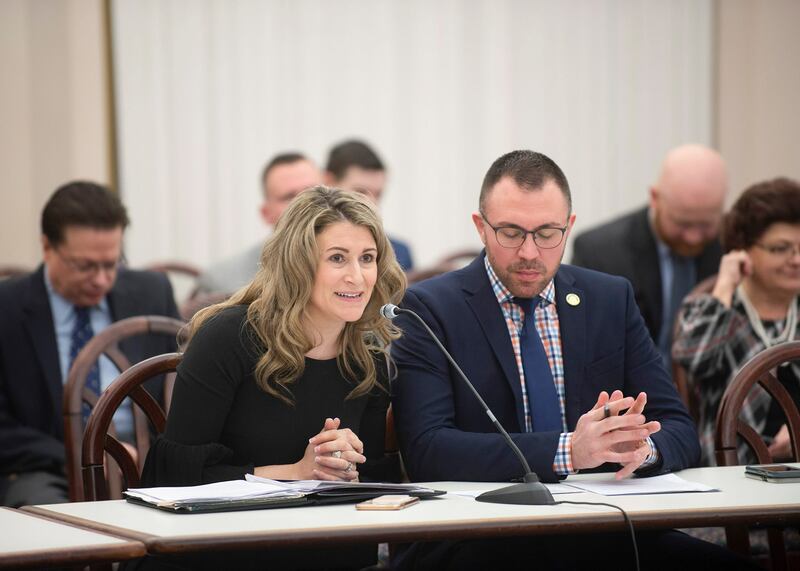 My bill to help first-time homebuyers, that Rep. Ryan Bizzarro (D-Erie) is also co-prime sponsor of, passed unanimously through the House Urban Affairs Committee this week! This bill would create the First-Time Home Buyer Savings Account Act to establish first-time home buyer savings accounts. The goal of the legislation is to allow Pennsylvanians to set aside savings, which may be used as a deduction on state income tax, toward the eligible costs of purchasing a first home. Passed in the House last session. House Bill 128 now moves to be considered by all House members. 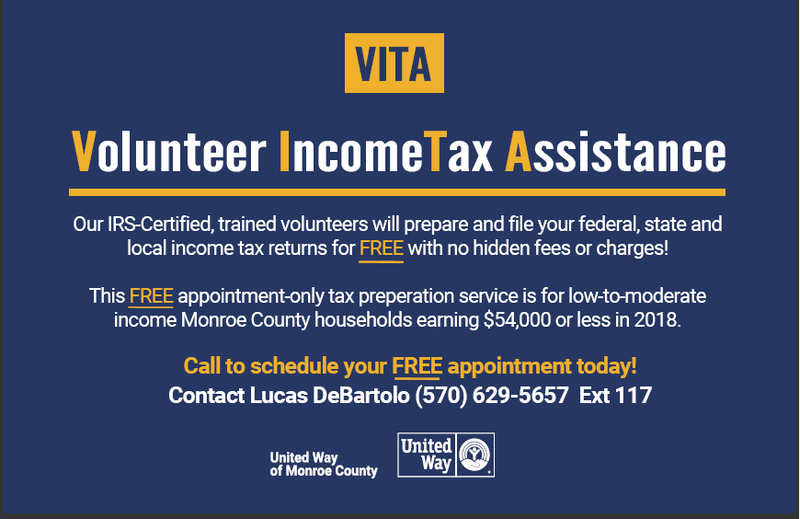 The United Way of Monroe County recently launched a Volunteer Income Tax Assistance (VITA) program. The program targets low to moderate income families in Monroe County. IRS-certified and trained volunteers will prepare and file eligible clients’ federal, state and local income tax returns for FREE with no hidden fees or charges. The service is by appointment only and is available to anyone in Monroe County with a household income of $54,000 or less in 2018. In addition, as an alternative for households with an income of $66,000 or less, United Way offers a FREE online tax preparation and submission process, powered by H&R Block, and supported through United Way. Simply visit MyFreeTaxes.com to prepare and submit your state and federal taxes. As Feb. 17-23 is Highway Safety Law Awareness Week, Traffic Safety Coordinator for the Highway Safety Network, Tracy Fox (better known as “Safety Fox”), has some safety reminders and information for this initiative. • Automated Speed Enforcement in Work Zones: Driving 11 mph or more over the posted speed limit in an active work zone may result in: first time will be a warning; second time will be a $75 fine and third or more times will be a fine of $150. Also, Fines in an active work zone are doubled. • Steer Clear with “Slow Down to Get Around”: This new law requires drivers to move over or slow down when encountering emergency vehicles. This now also includes stationary trash/recycling trucks and mail delivery vehicles. • Driving Under the Influence Changes: A third DUI within 10 years, depending on your blood alcohol content, will now be a felony. A fourth DUI within 10 years is now a felony. Also penalties have increased when a homicide occurs while Driving under the influence. Look for more tips from the Highway Safety Network next week! 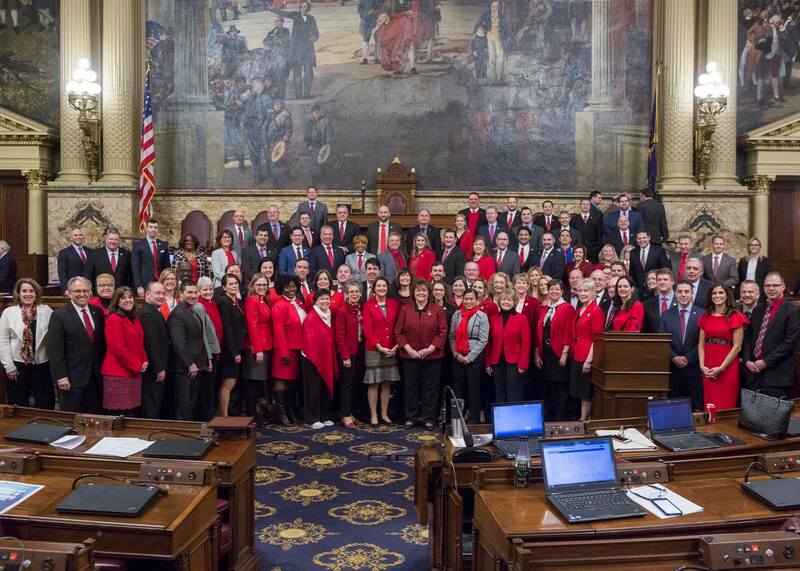 My colleagues and I wore red in honor of the Go Red for Women campaign, which raises awareness about women's heart disease. Applications for the Property Tax/Rent Rebate Program are now available on my website and at my district office. Residents should not pay a private entity for assistance in filing the forms. Copies of the forms, as well as assistance with filing them, are available at my office at no cost. Call (570) 420-8301 with any questions about the program. The budget process continues next week with the first in a series of House Appropriations Committee hearings to delve into the details of the governor’s plan. For a schedule and live streaming of the hearings, visit pahousegop.com.